Wii will rock you, originally uploaded by biroschik2000. One of the cool things about the Wii is that if you have friends who are fellow Wii owners then their Miis randomly stage a parade in your machine. 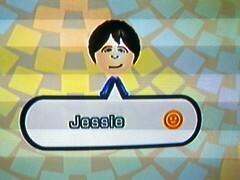 A friend of my friend Pete has decided to stage an impromptu one-person march on my Wii. 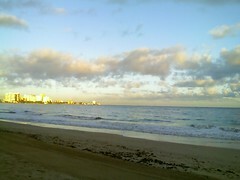 Puerto Rico Sunrise, originally uploaded by biroschik2000. I’m spending my birthday away from my family sitting here on the beach in Puerto Rico, but fear not - no wacky mid-life crisis for me. I’m on a business trip. Not to brag or anything, but my life has had a few bumps along the way, but is turning out about as close to perfect as I could ever hope. I would have to be an idiot to have a mid-life crisis. I realize that was a softball pitch there – keep the obvious clever rejoinders to yourself please. And the Karma Police should note that I said I’m not bragging.